Custom Cattle Tags.... Unbeatable Prices. Detailed step-by-step instructions are available by clicking on the “Help?” icon. Below is a quick overview of how to custom build your tags. You may order tags with sequential management numbers, blank tags or upload a spreadsheet (.XLSX) file with random numbers. Choose your tag color. The default color for tags is white. 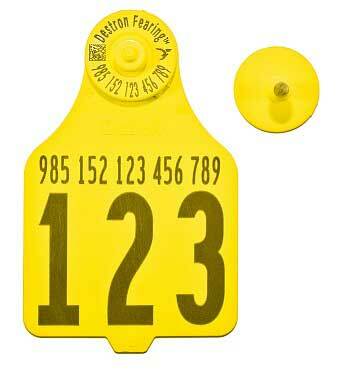 Choose the custom fields you would like on the front of your tag, back of your tag and the tag stud. You will only be able to select the fields available for the tag size being ordered. Small charges apply for some customized options. Type text or upload a graphic by using the “Browse” button. Text will be printed in ALL CAPS, graphics must be no larger than 100KB. When you are done click “Build Your Tags” to see a preview of your tag prior to ordering. Once you have closed the tag preview screen you may then “Add Tags to Cart” or “Edit Tags”. You will also be able to see a list of each management number in the bottom left hand corner. I want to include the letter A B C D E F G H I J K L M N O P Q R S T U V W X Y Z 0 1 2 3 4 5 6 7 8 9 before after the above numbers. I want to include the second letter A B C D E F G H I J K L M N O P Q R S T U V W X Y Z 0 1 2 3 4 5 6 7 8 9 before after the above numbers. Tag logos should be between 250x250 and 750x750 in pixels. Stud logos should be between 250x250 and 750x750 in pixels. Stud Color will be black. If you would like to order custom tags that have unique text on each tag, please read these instructions. You are able to type the information in a spreadsheet and save it as a (.XLSX) file for upload. Please do not build the tags one at a time. If you have questions, please contact our office for assistance at 816-383-5100 or email us. Returns are not accepted on custom tags orders. Tag/stud color, size and text location not exact to final product. Logo fee is 37.50 for each unique piece of simple artwork. Logo on front of tag – One-time fee of 37.50 and $0.14 per tag. Logo on the back of the tag - One-time fee of 37.50 and $0.29 per tag. (Printing on the back of the tag will be the same for the entire order.